The NEW SOLUTION (NS) is a compact affordable digital label printer press and digital label finisher with exceptional engineering build quality. It is manufactured by NEW SOLUTION Portugal and distributed in the UK by KTEC GROUP. The NS serves well as a short run variable label making facility both for commercial label printers and the label and packaging industry who need the versatility it brings. The NSPro is the printing machine based on the latest Sirius waterfall ink jet print technology from Memjet. 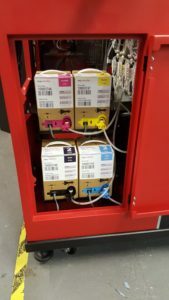 Using large 1000 metre rolls of self adhesive media and 2 Litre ink tanks the NSPro presents one of the lowest cost to print machines maximising profits and savings for the user. The NSPro includes a digital web steering guide to keep the material feed in perfect alignment as well as a web cleaner to remove any stray dust particles before the images are printed. 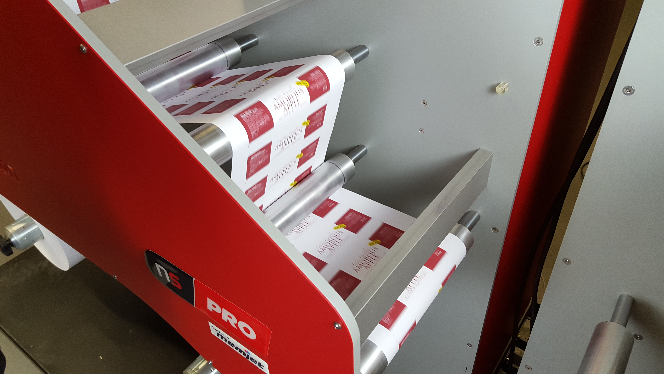 The printed rolls from the NSPro can be subsequently cut and finished on any digital finishing machine able to register on the printed images or on a small black mark printed along side each image row or stepped image array. The NSPro is also equipped with a label gap and black mark sensing so to be also able to print onto die-cut labels with gaps or black registration marks to the rear increasing its versatility. The NSF22 is a companion digital finisher for the NSPro. 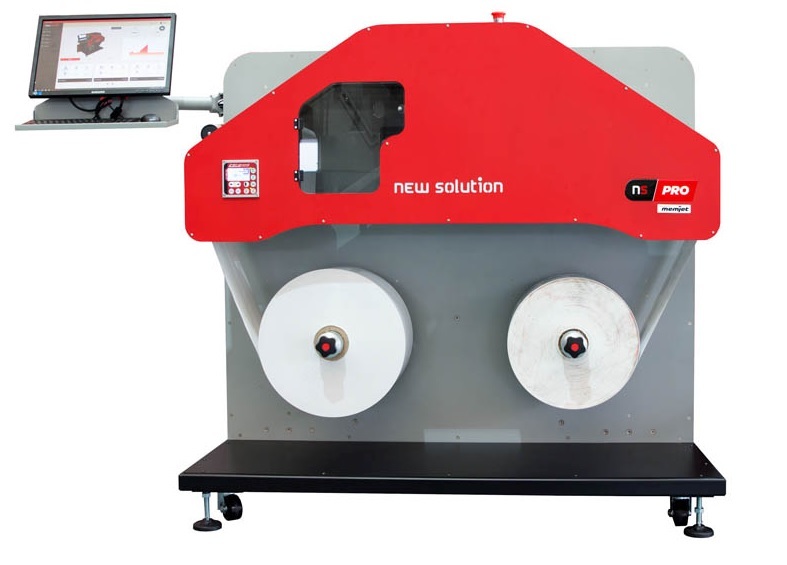 The printed rolls can be passed to the NSF22 if the machines stand alone, or the two machines are connected to form one machine able to convert low cost self adhesive media into any shape, size and quantity of labels needed in one pass roll to finish rolls. The NSF22 is also equipped with digital web steering so that the printed media is kept in perfect position for accurate cutting throughout the run. The NSF22 includes a laminating station so that the label web/ label images can be over laminated with a protective laminate for extreme durability applications. 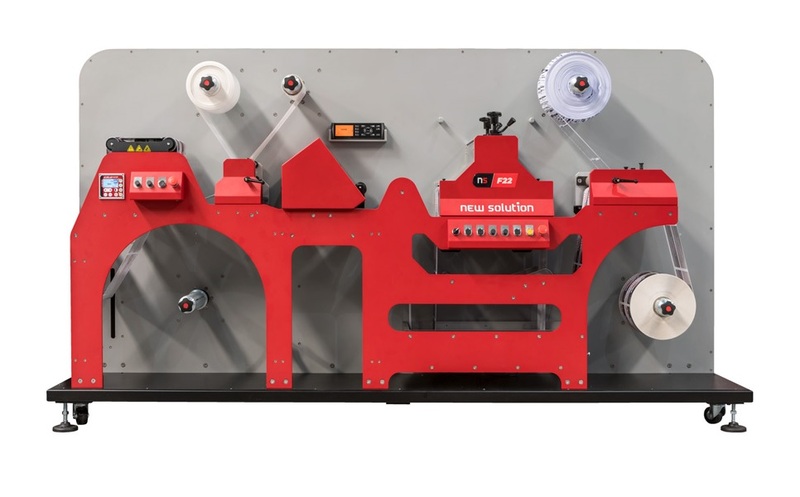 The NSF22 includes a digital drag blade label cutter station for intricate shapes or so that its possible to quickly print and cut different shaped labels without needing any die tools. The NSF22 also includes a high speed semi-rotary to register die-cut station with magnetic cylinder so when high finishing speeds are needed for longer runs the labels can be cut with a quick to fit conventional flexible die. The NSF22 includes automated waste matrix removal before optional slitting to lanes and then roll winding to finished rolls. The flexible die can include linear cut blades as well as label cut impressions so that labels are finished and slit with a high accuracy. The NSPro can be purchased separately if just wanting a digital label press with high capacity, speed and low cost per print, for use on pre-cut label rolls with gaps or black marks it will re-register and print labels. Adding the NSF22 and operating the machined in line, a compact digital label printing and finishing press is available to make all your prototype and short run and variable labels from low cost rolls of self adhesive media. Its possible to use a wide choice of software loaded to the NSPro for label printing and we find our customer often have a 'favorite' label print program they use each day. Of course label artwork is usually originated by an artist with skills to use a powerful design or drawing package like Adobe Illustrator / CS6, InDesign or Corel Draw. These packages can be run on the NSPro but its more likely the design software will be kept in the designers room and images made ready for printing on the NSPro using a much simpler program. We have used free programs like Adobe Reader to display and print labels on the NSPro. Some of our customers use our fully supported BarTender program to print labels that can be completely variable like for serial numbering, adding expiry dates, batch numbers and other data on top of background images as well as printing labels from a product list, even merging variable data into each label type from a spreadsheet, database or simple text file. For advanced use we support and can bundle the Xitron Navigator RIP that includes colour adjustment / correction ability. Both the NSPro and NSF22 are fitted with a digital web alignment detection and automatic web steering unit. 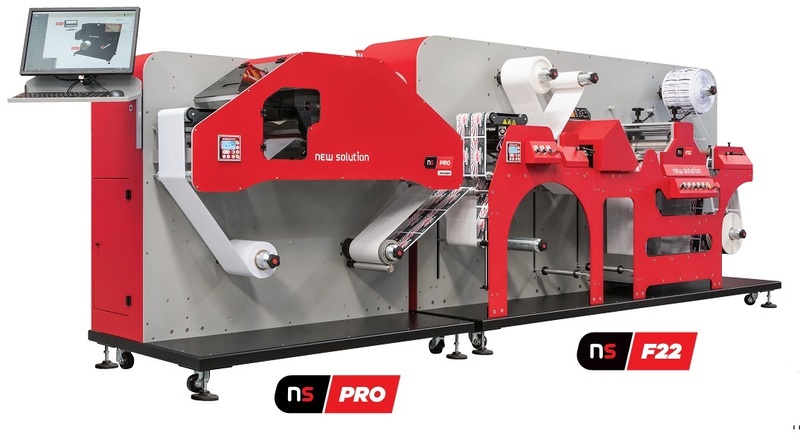 On the NSPro digital steering keeps the printed images accurately aligned on the web and finished printed roll and allows for narrow rolls to be used for those smaller label jobs and to prevent wastage. On the NSF22 the digital web guide ensures accurate tracking of the printed labels images through the choice of digital plotter cutter or servo rotary cutter sections as well as ensuring the laminate is accurately positioned when applied. Use your favorite label software or the optional RIP for precise colours. Use industry standard BarTender for ease of variable data printing. Use off-line roll to roll or in-line with NSF22 for one pass label manufacture.